This is hard proof that a NYDJ Henley Knit Top from Nordstrom and navy denim wide leg pants look amazing when paired together in a relaxed look. Black leather heeled sandals are guaranteed to infuse a hint of sophistication into your look. A NYDJ black henley shirt and navy denim shorts married together are a covetable combo for those who love cool chic styles. If you put practicality above all, this combination of a NYDJ black henley shirt and a black lace mini skirt is for you. Kick up the dressiness of this outfit a bit with black suede ankle boots. 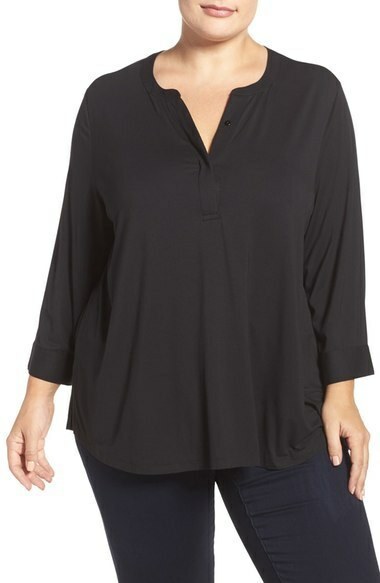 This combination of a NYDJ Henley Knit Top from Nordstrom and black skinny jeans will allow you to assert your styling skills even on off-duty days. This casual combination of a NYDJ Henley Knit Top and charcoal ripped skinny jeans can only be described as strikingly stylish. If you're wondering how to round off, a pair of black suede gladiator sandals is a surefire option. 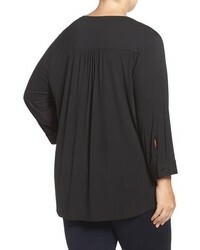 You can look chic without trying too hard by wearing a NYDJ Henley Knit Top and charcoal ripped skinny jeans. If you're not sure how to finish, a pair of black leather gladiator sandals is a foolproof option. A NYDJ Henley Knit Top and a charcoal mini skirt are a nice combination worth having in your daily collection. Give your outfit an extra dose of style with black leather ankle boots. This laid-back combination of a NYDJ Henley Knit Top from Nordstrom and grey print pajama pants is effortless, seriously chic and oh-so-easy to recreate! Our favorite of a great number of ways to finish off this ensemble is white slip-on sneakers. Assert your sartorial skills by combining a NYDJ Henley Knit Top from Nordstrom and black skinny pants for an off-duty combination. Get a little creative on the shoe front and add a pair of black leather loafers to the mix.